Technovision Engineers Pvt. Ltd. Manufacturer & Supplier of a wide range of products which include ABS Coated Pipe. ABS Coated Pipe, is HSLA steel pipe coated with ABS resin. This ABS coating prevents the pipes from rusting and it provides excellent wear and impact resistance. 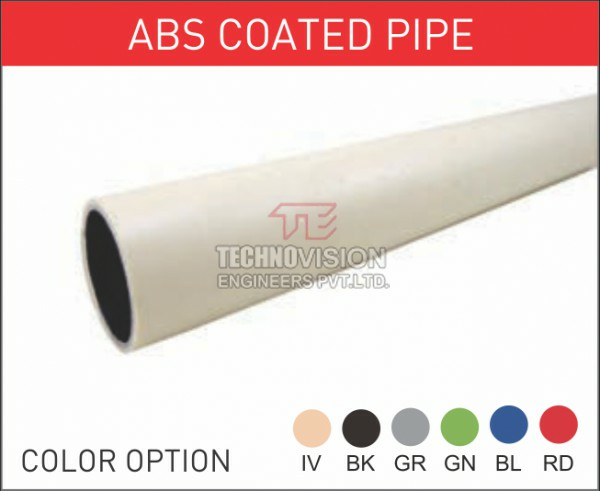 Technovision ESD Pipe is ABS coated pipe with Electrostatic Discharge capability. Coupled with Nickel fitting, it can be used clean room & ESD sensitive environment. Our company has acquired one of the top most positions in the industry for manufacturing and supplying a wide range of Coated Pipes. These pipes are widely used in various fitting purposes. Our clients can avail these pipes in different dimensions. Manufacturing and supplying a qualitative range of ABS Coated Pipes enables us to gain appreciation from our valued clients. These pipes are known for their consistent dimensions throughout the length. Our pipes are manufactured using high quality metal alloys that ensure their low degradation rate and high performance. Their non-corrosive nature makes them durable. Our clients can avail these pipes at reasonable rates and in different specifications.